Digital signage, mobile tickets and free Wi-Fi highlight stadium tech upgrades. Fans want more than a nosebleed seat at college football games: They want a multiscreen experience. Many football stadiums are attempting to provide just that, as colleges across the country implement enormous digital screens and wireless networks so fans can use their own devices. IT workers see this as an extension of BYOD (bring your own device). Most colleges allow students and faculty to access campus networks with personal devices, but stadiums are a different beast. Beyond the obvious security implications, the infrastructure requirements necessary to connect thousands of fans simultaneously are overwhelming. 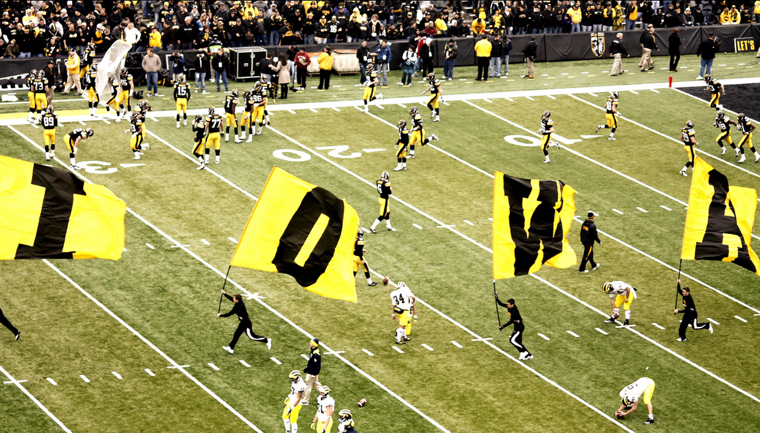 Here are a few stadiums that are rolling out tech upgrades for the 2013 season. Is your college upgrading its technology this fall? Let us know on Twitter and we’ll add you to the list. Here’s everything the project includes: a large screen video display system within the existing south end zone structure, video displays in the northeast and northwest end zone corners and a ribbon display to be installed above the seating along the north side of Kinnick Stadium. That ribbon display will show game information, video, scores and advertising. In addition to those four video displays, the purchase includes two game clocks and four delay-of-game clocks. The existing video walls, control room equipment and sound system at Kinnick are eight years old, officials said. Technology in that time has made great strides, and most of the UI’s competitors now have high definition video boards in their stadiums, UI athletics director Gary Barta said. Until just a few days ago, the Big 10 conference limited teams’ stadiums to a single replay on in-stadium monitors. With the restriction lifted, the University of Wisconsin Badgers will get to take advantage of their brand-new, $5 million video screen and scoreboard. At 50 feet high and 170 feet wide, it’s one of the largest in the NCAA. To add even more to the overall fan experience, [associate athletic director Justin] Doherty says UW is currently working on improving connectivity in not just Camp Randall, but other venues like the Kohl Center, to allow fans to quickly send pictures, tweets, texts and share their game experience with friends and family. Wisconsin is also exploring a mobile concession service, where fans could place food and beverage orders on smartphones, according to Madison.com. The concessions could then be picked up between quarters so that fans wouldn’t miss the game. Like many colleges, Virginia Tech is upgrading its video screen. The school has invested $3 million dollars in digital signage for its football stadium. The stadium will feature a 5,215-square-foot digital scoreboard that is close to five times larger than the one it will be replacing. The Virginia Tech Athletics Communications Office will also be engaging with fans on Instagram. The growing mobile trend is an opportunity for fans to share their experience. The Athletics Communications Office will use a different hashtag for each football game and will post the best photos on the Virginia Tech Instagram account. In 2011, as part of its partnership with AT&T, Stanford became the first college to offer free Wi-Fi in its football stadium. As the video above explains, any fan with a smartphone can connect to watch replays and get real-time statistics. While Stanford fans are used to wireless access in the stadium, they will now also be able to use their mobile devices at the ticket gate this year. Tickets can be sent to fans’ smartphones in a PDF format or added to Apple’s Passbook application for scanning. 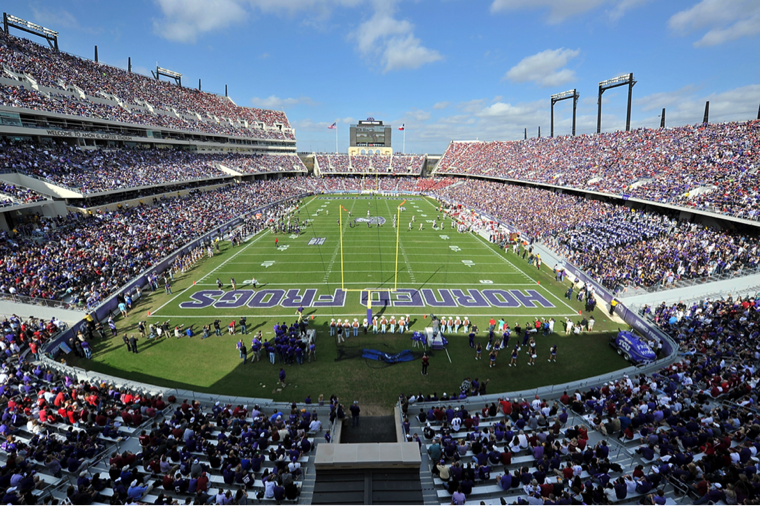 TCU plans to have Cisco Connected Stadium Wi-Fi fully rolled out by September 7, when the Horned Frogs play their first 2013 home game against Southeastern Louisiana University. However, Lucas and the team he assembled with Cisco Systems and AT&T expect to tweak some of the Wi-Fi coverage, once they see what the usage rate is in the student sections. Read a detailed overview of TCU’s technology upgrades.